The Capybara is the biggest living rodent in the world. It is most similar to guninea pigs, agoutis, chinchillas, and coyphillas. It looks like a giant guinea pig with longer legs. It has a heavy, barrel-shaped body and a short head. Its fur is reddish-brown on the upper part of their body and yellowish brown underneath the body. It has tough skin, which is sometimes used to make good quality leather goods. Adult capybaras may grow up to 130 centimetres (4’3″) in length and weighs up to 65 kilograms (140 lb), It is about 50 centimetres (20 inches) high at the shoulder. The heaviest capybara was 105.4 kilograms (232.4 lb). They have slightly webbed feet and no tail. Their webbed feet really help them to be great swimmers. They carry out most of their activities on land. They can hold their breath underwater for up to 5 minutes. Therefore, they can hide from their enemies by ducking down into a pool. During hot days, they will spend time playing in the water. They will eat in the late afternoon, early evening and at night. They do not sleep much. Their rear legs are slightly longer than their front legs. Their muzzles are blunt. The eyes, nostrils and ears are on top of their head, so they can easily be kept above water when swimming. 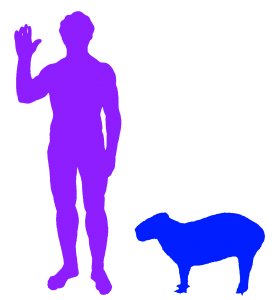 Female capybaras are slightly heavier than the males. The females are between 36 to 66 kilograms (80 to 145 lb) and the males are about 34 to 61 kilograms (75 to 135 lb). 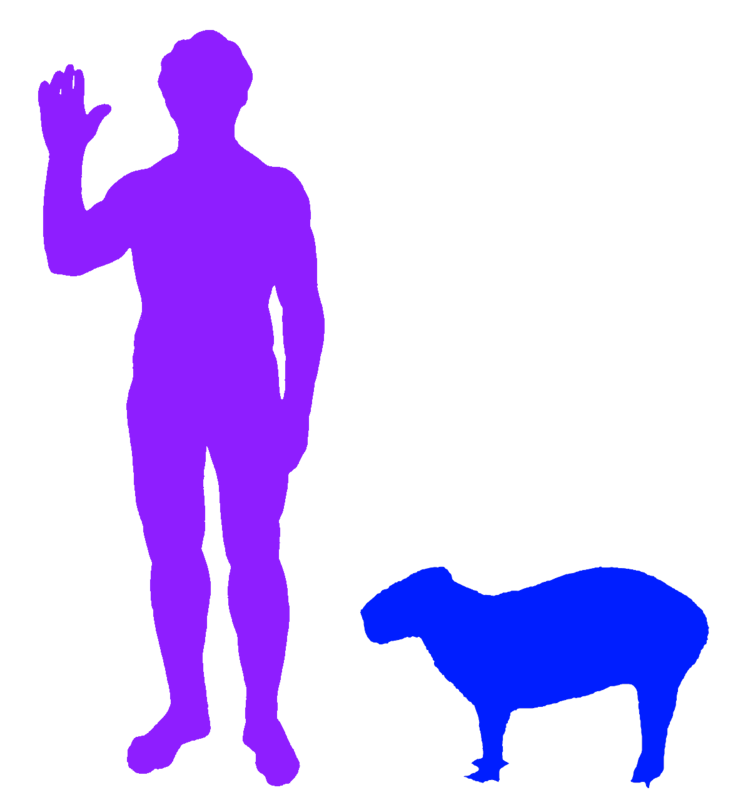 There are extinct capybaras which were 40% bigger than the ones alive today. It was found in North America and weighed 90 to 110 kilograms (200 to 250 lb). Capybaras are semi-aquatic mammals. They are found wild in Columbia, Ecuador, Bolivia, Venezuela, French Guyana, Uruguay, Peru and Paraguay. They live in thick forest near lakes, rivers, swamps, ponds, marshes, in flooded savannahs and along rivers in tropical forests. Capybaras are plant eaters. They eat mainly grasses, aquatic plants, fruit and tree bark. 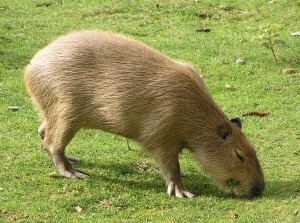 An adult capybara will eat 2.7 to 3.6 kilograms (6 to 8 lb) of grass per day. Capybaras are very fussy eaters. Their focus is only on 4 to 6 different types of plant – and these make up three quarters of its diet. They will pick on particular leaves and ignore the leaves all around from other types of tree. But Capybaras eat a greater variety of plants during the dry season because there are fewer plants available during that time and they cannot afford to be fussy. They eat reeds during the dry season instead of grass. Because grass is hard to digest, they eat their own poo so they get to digest it twice. They also have special bacteria that helps to digest the grass that they eat. They may also vomit out their food to chew on it again like a cow. If they are very lucky, they can live between 8 to 10 years in the wild. On average, however, they only live less than 4 years because they the favourite food for many jungle animals, including jaguars, anacondas, pumas, eagles, ocelots and caimans. All the mothers in the group help care for capybara babies - picture by "Bradypus"
Capybaras like to live in groups of 10 to 20 individuals with 2 to 4 adult males, 4 to 7 adult females and a whole bunch of young ones. Group sizes change according to the season. During the dry season, when there is less water, larger groups form near the little water there is. Group can be as big as 50 to 100 individuals. The group is controlled by a dominant male. Capybaras are very vocal. They will make sounds like a dog barking when they are threatened. Cabybaras grow up within 22 months. Mother capybaras will give birth to 2 to 8 babies in one birth. They give birth on land. Within a week after being born, the babies are able to eat grass but they will still continue to drink milk from their mother or other females in the group for about 16 weeks. All the females in the group help care for the babies. Capybaras have 20 teeth. Their front teeth and cheek teeth grow continually. When they are fully grown, a capybara will sometimes suffer from sunburn because their hair becomes very coarse and thinly spread. To avoid getting sunburnt the capybara will have to roll in the mud until its skin is all covered. They do not like the sun. They are not considered an endangered species. They are hunted for their meat and fur in some places and killed by humans when they start eating the grass people want for their livestock to eat. In some areas they are farmed, which ensures that the wetland habitats in which they live are protected. On the whole the fact that they breed rapidly makes it much easier for them to survive in the wild. They are found in the zoos and park. In captivity, they are able to live for 12 years. They are gentle creatures and will usually allow humans to stroke and hand-feed them.